Do you keep your PC tower on your desk? No? Neither do I and I don't think there are too many people that do anymore, mostly because these big boxes take up so much space. We put them under our desks, but that's hardly elegant. A far more stylish and, dare I say, minimalist approach could be the new Cryorig Taku, a monitor stand PC case built by the fine folks at Lian Li. Lian Li is no stranger to thinking outside the box. Remember that they're the ones responsible for the series of desk PCs. 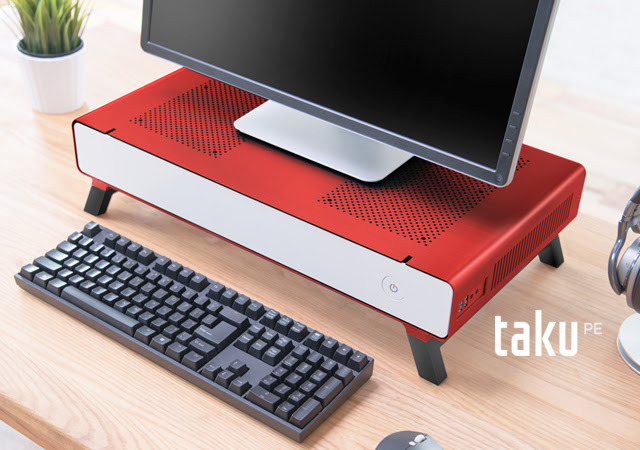 With the Taku, you get a slim and flat full ITX PC that serves double duty as a monitor stand. Just plop your monitor on top and you've got yourself a workstation worthy of the IKEA catalog. First showcased as a concept at last year's Computex, the Cryorig Taku is now being put into production... so long as they get the funding from the crowd they desire. Among some of the quick highlights include a easy pull-out system tray, space for GPUs up to 280mm, ITX motherboards, and multiple spots for HDDs and SSDs. The space underneath will accommodate a full size keyboard too. Find more information on the Kickstarter page where a Cryorig Taku can be yours for a pledge of at least $250. They've set a funding goal of $100,000 with the end date set for July 27. They're expecting to start shipping these to customers in September. More pics and the full press release below. 29.05.17 Taipei, Taiwan – CRYORIG, the PC Cooling and peripherals innovator is releasing their first PC case project the Taku on crowdfunding website Kickstarter. The Taku, first announced and exhibited last summer, will also be shown during Computex 2017. The TAKU has been in development for over 2 Years in house, with over 6 months of co-development with manufacturing partner Lian Li. The Taku Kickstarter campaign begins on May 29th and ends on July 28th. Besides offering backers the chance to be the first people to receive the Taku, backers are also offered multiple customization options only available on Kickstarter. 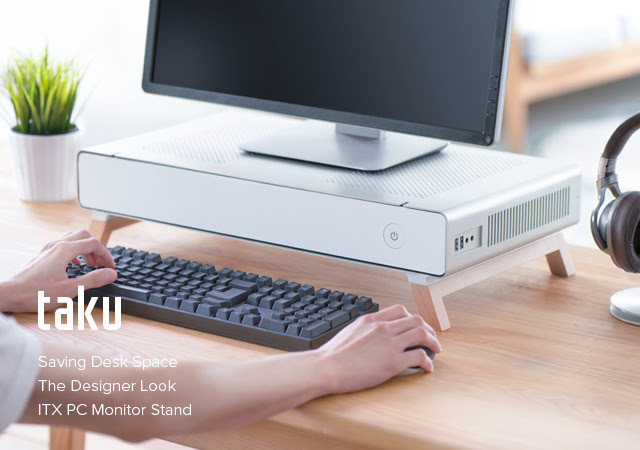 The TAKU is a hybrid between a PC Monitor Stand and a high-end ITX form factor PC case. With the TAKU, the PC footprint is minimized to free up desk space while at the same time fitting a high-performance PC system. The benefit of this state of the art design is that the monitor, keyboard and the full PC system is arranged vertically on top of each other. Meaning the total footprint is lowered, and valuable deskspace is freed. The Taku is compatible with GPU’s up to 280 mm, ITX form factor mainboards, SFX or SFX-L power supplies, fully capable of housing a high-end Gaming PC. Taku’s storage space is also well taken care of. The Taku can also fit 1x 3.5” HDD and two 2.5” SSD/HDD. As a PC Monitor Stand the Taku can support monitors up to 15 kg and fit a full 104 key mechanical keyboard underneath the stand. The system tray can be fully slid out of the chassis for easy installation of PC components or upgrades. On the right side of the Taku you’ll find dual USB 3.0 ports and audio in/out ports. An USB-Type C port will be made available in later revisions. The Taku will also include two cable management holes at the front. This allows for cables to be run through the system tray and connected to the back ports of the Taku. Providing easy and clean cable management of USB charging lines for your phone or peripheral. 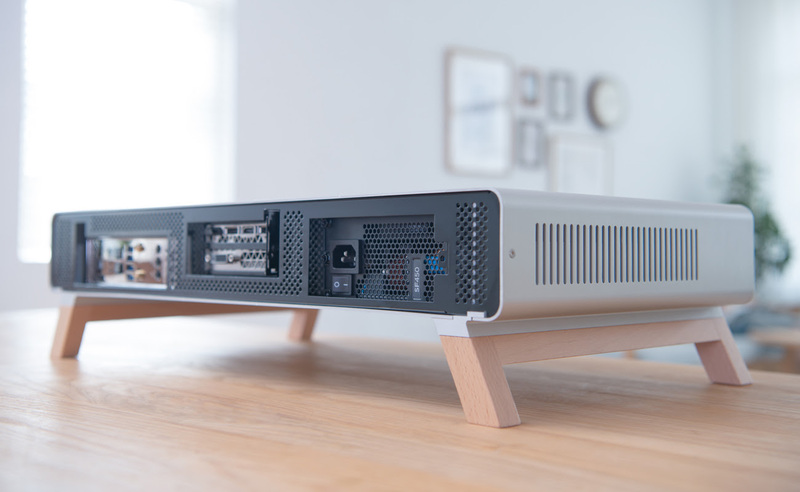 With the Taku, CRYORIG combines wood and aluminum to create an organic feeling piece of Technology that would fit perfectly into any home, or work environment. CRYORIG is going to add one C7 ITX Cooler free of charge, if the Taku project exceeds 1.000 units. The Taku campaignwill begin on May 29th and offer multiple colors and material options for users to mix and match. Early bird backers will be able to get the Taku at USD$ 250 (-VAT,-shipping) with standard Taku Classics going up to USD$ 299(-VAT,-shipping), the custom TAKU PE’s cost will depend on customization options. First shipments of the Taku will go out to backers beginning September 2017.
and 3.5mm Audio in/out ports.